Central Coating Company is proud to offer a full-time roof service department staffed by CCC-certified roofing service personnel. Regular maintenance made by our qualified Service Technicians will help maintain the long-term integrity of your roof system and help you avoid costly leak repairs now and in the future through our comprehensive maintenance program. 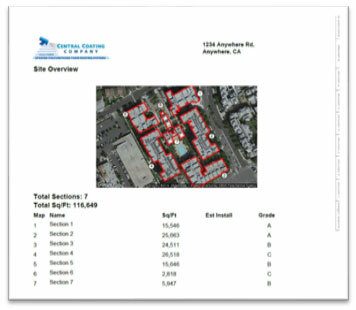 Our Roof Portfolio Management System is ideal for Property Managers, Facility Managers, and Building Owners who have multiple buildings or complexes and need to track their roof conditions and life cycles from their desktop or mobile device. Comprehensive photo-based inspection report including: roof overview and composition, roof observation photos and detailed deficiency descriptions with repair recommendations.